1: What are the most precise, descriptive nouns? Often when we think of description words, we think mainly of adjectives (words that describe the appearance, sound or smell of a noun) or adverbs (words that describe the way a noun does something). Nouns themselves have degrees of descriptiveness. Compare, for example, the words ‘child’ and ‘brat’. A narrator who constantly refers to his next-door neighbours’ child as ‘the brat’ will come across a particular way. Their persona will seem very different to one who simply refers to ‘the child’. The former may seem angry or crotchety, a person who doesn’t enjoy the company of children. This could also tell us about the child’s behaviour (perhaps they continuously play cruel pranks). The more descriptive noun could thus describe both the neighbour’s attitude regarding the child and the child’s behaviour. 2: Have I chosen the most descriptive adjectives? Instead of ‘sweet’ you could write ‘saccharine’ (meaning ‘excessively sweet or sentimental’). Rather than ‘red’, you could write ‘crimson’ (a ‘rich deep red colour inclining to purple’). Instead of ‘technical’ you could write ‘specialized’. Sometimes a different adjective is useful because it shades your description with extra intensity. When we read ‘The king ascended to the dais slowly, his red robes scarcely stirring,’ we see the overall motion. Yet replace ‘red’ with ‘crimson’ and we see a more specific shade. Specific and precise adjectives add variety. The important thing is not to go overboard. You don’t have to describe every shade of red known to man to make a coronation colourful, for example. But a little variety and specificity will add panache to your descriptions. 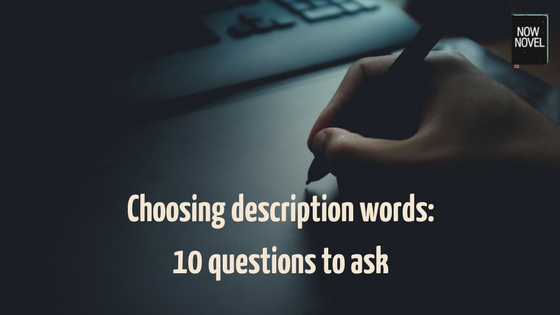 3: Are my description words building cohesive tone and mood? When you choose describing words, decide what mood you want to create. An excellent author to read for descriptive mood and tone is J.R.R. Tolkien. The contrasts between the peaceful Shire, the land of the hobbits, and the Elves’ forest homeland, Lothlórien, makes both places distinct. There is a consistent tone of wonder and calm in Legolas’ description, from the ‘golden’ qualities of the forest to words that suggest strength (‘pillars’), abundance (‘laden’) and order (‘smooth’). 4: Is there extra meaning in your describing words’ etymologies? Etymology (the origins of words) is worth dipping into when writing description. Sometimes a word in English has distant Latin, Greek or Germanic roots that add an extra subtle shadow of meaning. The word ‘swipe’, on the other hand, means ‘to strike with a sweeping motion’. It became a synonym for stealing supposedly around 1885, as prison jargon. ‘Swipe’ contains connotations of sudden movement from the word’s original meaning. Thus there is more of a sense of opportunistic, sudden, illicit seizure, rather than stealth. When you want a synonym for a word in your description you feel is bland, explore origins via an online etymology dictionary. See if there are lucky secondary meanings that fit your scene and make your description even stronger. 5: Have I balanced description with action, dialogue and narration? Although this isn’t the worst description ever, describing characters’ features in context draws attention to the author’s steering presence less. Doing so allows your reader to immerse themselves in your world more. So how do you balance your description words with action and narration? 6: Are my descriptions clichéd? Because clichés are overused, we notice them more because they are unimaginative than because of the detail they attempt to show. 7: Can I condense my description and achieve equal effect? Truly effective descriptions are often powerful because of how concise they are. They say a lot with little means. The more abstract words you use (e.g. ‘He was strong and courageous’), the less precise our image of a character becomes. Kingsolver starts with the general, describing the abundance of wildlife in simple terms. From here she moves to particulars, focusing on just one creature: the frog. Her simile is exact: ‘war-painted like skeletons’. The exoticism of this description conveys the character’s psychology at this point. It contains elements of both wonder and fear (in the comparisons to symbols of conflict and death). This specificity reads as apt for a US missionary’s wife who is newly transplanted to Central Africa. As a whole, the description is compact, showing both general and particular details about the local forest. 8: Would it make sense to involve more of the senses? When describing, we often focus on the visual because we are building a world with visual referents. Yet the other senses (touch, taste, smell, hearing) are useful too. When you’ve described a scene, go back and ask if any of the senses are lacking. What is a bakery, for example, without its smell? What smells might a character notice first there? A character who loves food might describe the aromas of this setting with detail and relish. A character who is mostly pragmatic about food, by contrast, might describe the shop owners’ or other patrons’ appearances rather. Think about not only how you can involve the senses, but who is using their senses and which of their senses are most dominant or relevant. 9: Could I avoid adverbs using more descriptive verbs? Adverbs (words that ‘give information about a verb, adjective, or other adverb’) can be useful. Some authors see them as lazy and hallmarks of poor style. It’s true that instead of writing ‘she ran very fast’, ‘she sprinted [or bolted/tore/sped]’ is stronger. Strong verbs are simply more descriptive than a bland verb such as ‘to run’ plus an adverb of degree. Besides finding strong verbs, you can show a character’s inner state and external expression of this state with movement and gesture. Perhaps a cross character points her finger or strikes her thigh in impatience with a clenched fist. Details such as these are often stronger than adverbs. Perhaps the clenched fist character struggles to contain anger appropriately so she directs it inward (hence striking herself in a moment of fury). List descriptive verbs when you’re writing a scene requiring stronger action. Try different options to see which will be most compelling. 10: What description words have successful authors used to describe similar characters or scenes? Descriptions by accomplished authors are useful reading when you want to create a specific tone or mood. For example, if you want to create an eerie or supernatural atmosphere, an author like Edgar Allan Poe or Stephen King will inspire. As you read, whenever you find a description vivid and believable, jot it down in a writing journal. Categorise descriptions (e.g. have sections for ‘character’, ‘setting’, or more specific details such as ‘eyes’ and ‘houses’). This way, when you’re next describing character or settings, you can dip into your description example handbook for inspiration. Want to improve your character and place descriptions? 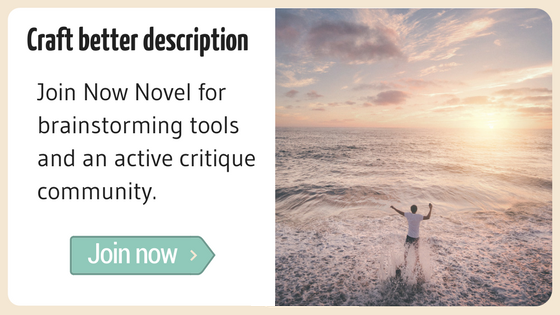 Sign up for Now Novel for tools and guides that will help you make the world of your story vivid and intriguing.